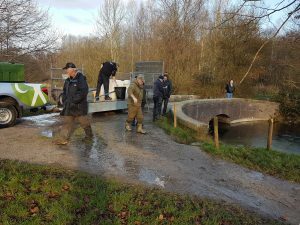 Many many thanks to everyone who has contributed to our winter 2018/19 restocking fund appeal….. we raised just over £3,000 and have spent most of it on fish for Drinkwater Park. See video below – we have stocked 130 2-3lb carp. 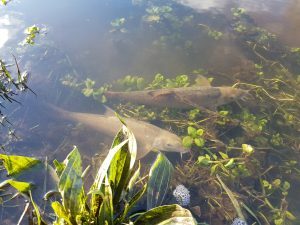 We hope that these new carp will root about in the silt at the bottom of the lake and reduce the amount of blanket weed in the lake…… a two for one really….. more fish to catch….. better conditions to catch them in. Our intention is to spend the remainder on fish habitat improvements at Broughton Park Lake (preparing the lake for a stocking of Rudd next year). 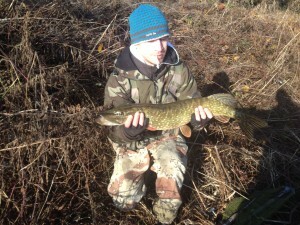 When young Alfie gets to double figures – we hope that this carp will have too ! 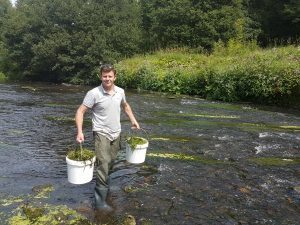 Great news for anglers today – The our local Environment Agency Fisheries Team have restocked the River Irwell with 7,000 Barbel Chub and Dace. 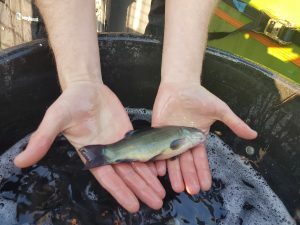 4,000 fish were stocked at Littleton Road playing fields in Salford, and another 3,000 further upstream in Radcliffe and Bury. 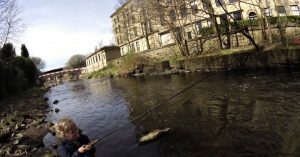 This restocking is a continuation of the Environment Agencies support for The Irwell which sadly seems to suffer from more pollution incidents than most – and whose fish stocks need a regular boost. I could waffle on for ever – but these pictures and videos tell a far more eloquent story than I can. 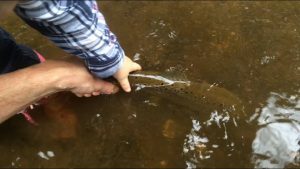 Irwell Barbel – no longer as rare as hens teeth! 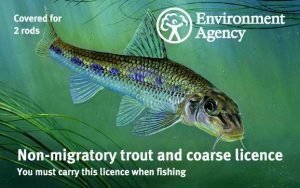 Paid For Via Your Rod Licence – make sure you buy one !! We are holding our annual Christmas Fish In / social event on Saturday 29th December 2018 and would be delighted if you decide to come down and fish, or just come say hello for a drink and a chat. Venue – Old River Irwell – Ferry Road, Irlam M44 6DN – free parking in the Boathouse Pub car park. Most anglers will be trying to catch some of the superb pike which live in the Old River – but a couple of others including club chairman Mike Duddy will be trying to build a net of silver fish on bread punch. 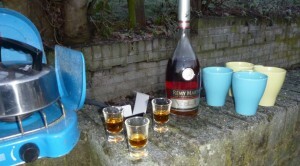 We will have a lovely bottle of Cognac to share, and help make the conversations flow. Please come and join us – and be a part of our Friendly Society. 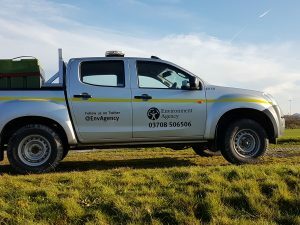 We are delighted to share with you the videos and photos from today’s’ restocking of Drinkwater Park Lake and Agecroft Pond by the Environment Agencies Fisheries Team. 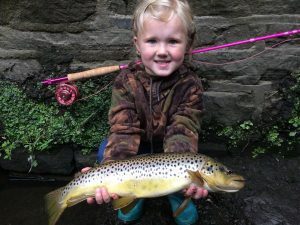 These two lakes are extremely popular with young anglers from the local housing estates, and todays restocking will ensure their popularity for years to come. 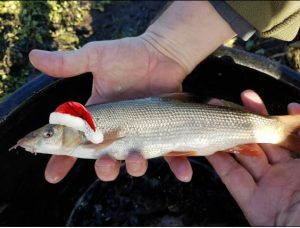 We had no idea that these fish were on the way to our lakes until Monday — with the fish arriving today Friday… a great Christmas present from the EA. We were initially informed that the EA had a few hundred fish to help our existing restocking efforts on these lakes, and were gobsmacked when they turned up this morning with 7,500 fish of the highest quality. 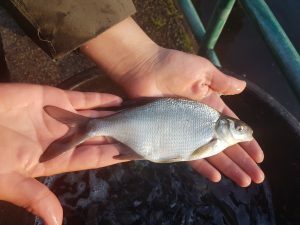 A mixture of Tench, Rudd, Bream and Roach – the fish which are only a year old have already reached a good size… helped by this years long hot summer. 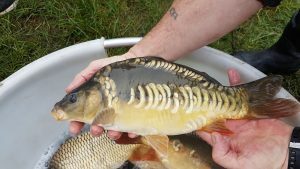 We are continuing our fundraising efforts – to enable us to add a few new carp to these lakes to help stir up the bottom, which we hope will hinder blanket weed growth which has plagued the lakes in recent years, and also to colour the gin clear water as a deterrent to predation from above. 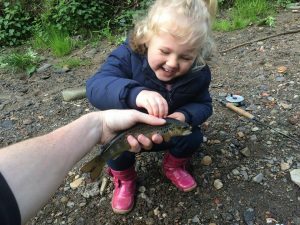 Again – Many thanks to the Environment Agency Fisheries Team and the National Fish Farm at Calverton – you have made a lot of young anglers (and old uns) very happy indeed. 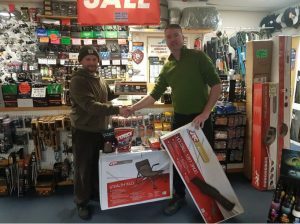 Many thanks to Mike Donigan the owner of Monton Tackle shop who has generously donated some fab bits of tackle to be used as raffle prizes at future club meetings. The money raised from these raffles will be put towards our clubs restocking fund. We have ambitious plans for 2019 and need all the ££ we can get. It’s sad to see so many angling shops closing their doors – so it’s important that we support the ones that are still left. If the tackle shops go – where will we buy our fresh bait from? where will be able to drink free tea, lurk, and avoid our loved ones ? Salford Friendly are keen to support all our local shops,,, and we have compiled a list here on our website here – please think when spending on tackle – and try to shop local whenever you can. 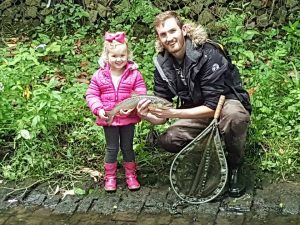 Attention angling people – Salford Friendly Anglers are going to be holding a fishing session every Friday in September and October between 10am and 12am at Broughton Park Lake in Salford..
Everyone welcome to attend – a great time to bring non-fishers and people who want to learn how to fish. Hot drinks, bait and tackle provided – just come down to the lake at 10am and say hello. Park at the end of Okeover Rd, Salford, M7 4JX – walk throught the park gates at the end of Okeover Rd, and you will find everyone at the side of the lake near the childrens playground. 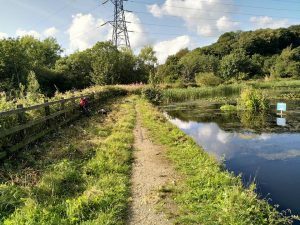 As always – we have received a tremendous response from our members after a recent call for help regarding needing people to help out manage our waters..
A great example is this bit of work clearing the vegetation on the path around Waterdale in Philips Park by Ste and Dave. I’ve had a walk around most of our waters during the last week – and theres lots of work that needs doing – clearing pegs, tidying up rubbish and raking weed to create swims. We’ve had a great summer 2018 with all our waters fishing well. 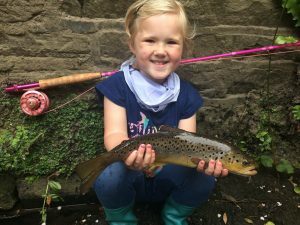 There have been the usual issues to deal with – litter, low water levels on Drinkwater Park Lake, and on the River Irwell caused by the long hot summer – but this hot weather has resulted in fantastic amounts of fish fry in all venues. Remember the long hot summer of 76 and then how great the fishing was in the following years ? lets hope we get a repeat of this and our fish stocks go from strength to strength. 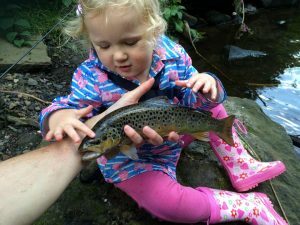 We have some good news – an agreement with Bury Council confirming our fishing rights on the River Irwell and Roch at Springwater Park in Whitefield (that includes the weeded up Springwater Lodge) and the opposite bank at Close Park. Really great water that offers a variety of fishing and species. 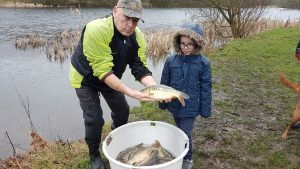 We have also taken on the fishing at Broughton Park Lake (also known as Clowes Park) postcode M7 4EN – in a joint venture with Broughton Angling Club – we restocked the lake earlier this year with 500 x 6 inch tench and 80 x 1-2lb carp. The tench arent showing yet but the carp are packing on weight coming out at nearly 4lb already. The venue is in desperate need of a good tidy up (years and years of rubbish) and a work party is going to be announced very soon. 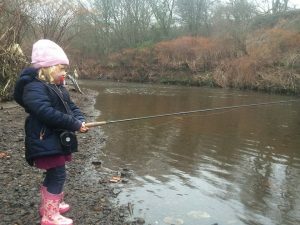 The Old River in Irlam is also fishing tremendously well – the carp which were stocked at 2-3lb last spring are now being caught at 8lb. The tench and bream which we have been stocking over the last 4 years are now showing in anglers catches and there is evidence that these fish are also breeding. 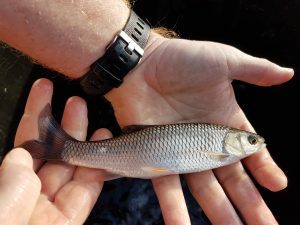 The Quays continues to throw up specimen fish of all species but the Rochdale Canal has fished poorly this summer with frequent lowering of water levels and repeated pollution incidents. So far we’ve had a tremendous response with a number of anglers offering to take an active role in managing their favourite venues. All we ask is for a fortnightly visit to litter pick, and keep a general eye on the venue – plus a report back to club meetings to allow us to develop a better management plan for each venue. We don’t ask for much from our members – other than for you to respect our waters, our fish, and other users of the waterside. However – this is a call to arms from the committee to you our members. We are having a real struggle to maintain our waters this summer – as new jobs – family commitments – illness – overtime and loads of other excuses mean that those members who organise events like matches and work parties have been unable to commit as much time towards club activities as they have in the past. We are aware that this can’t carry on. New waters are being offered to the Society on a regular basis – for example Gregsons, Blackleach, Lankies, The Rat and The Cow ponds – we’d love to take them on – but we need to be able to manage our waters properly before we take on any new commitments – as at present – all these commitments fall on the shoulders of a few. 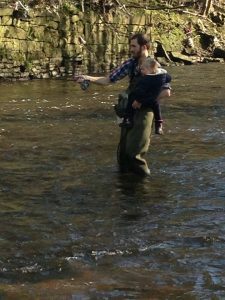 Therefore we are asking you as a member of a fishing Society to stand up and be counted for you local lake – be it Drinkies – Waterdale – The Old River – Broughton Park, Springwater Park Lodge, The Quays or the Rochdale Canal – we need your help managing them. 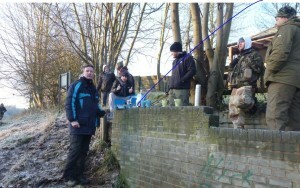 We think that it would be a good idea for anglers to come forwards and say “I’ll be happy to give a few hours a month to help clean up and maintain my local fishing venue” – it really doesn’t take much. 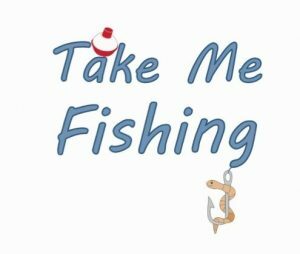 Our intention is to create a list of members – who can be called on to get involved in the fishery management of each of our venues – its great fun and in a way its a bit like looking after the biggest garden pond you’ll ever have. The club regularly cobbles together funds/money/grants for restocking and the members who stand up for their local venues will be supported in developing a management and restocking plan for each venue. So – our next club meeting is going to be Wednesday the 22nd August at the Star Inn, Back Hope St, Salford, M7 2FR when we will be discussing this further. 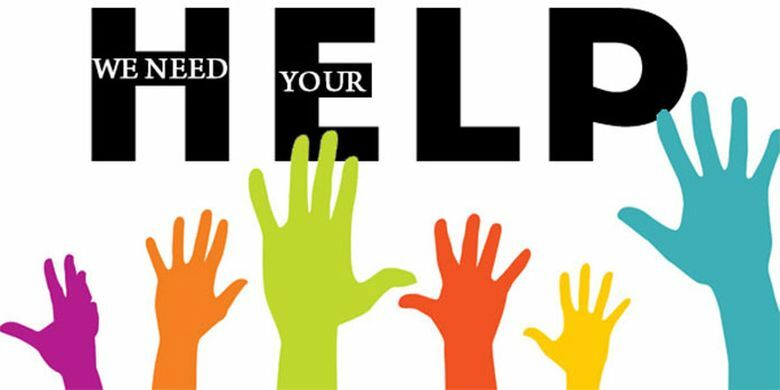 If you would like to put your name down to be involved more actively in the management of your local venue – please email the club via admin@salfordfriendlyanglers.co.uk or make us aware on our facebook page. AND PLEASE COME TO THE AUGUST CLUB MEETING! If we can get more people involved in the day to day running of our venues – then we will be happy to take on new waters. 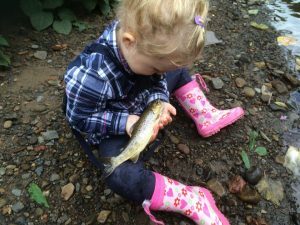 Family Fishing – Does It Get Better Than This ? No more words necessary from me…. read on and click on the pictures to see full size images..
It’s been 2 years since Emily started coming fishing with me proper, something i only got back into myself the year before, no longer seeing my dad due to problems in my family that were irreversible in resolving it was both the memories we created together and the understanding of why he took me that i wanted to get back into it and ultimately take Emily. It is a brilliant sport to keep your mental health in check, it allows you to enjoy things you would never see too numerous and small that too some it would seem like nothing but to those in the know it’d mean everything. 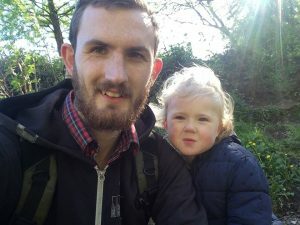 And despite it being a lot easier and safer not taking my daughter having been taught from the age of 3 myself, i knew she wouldn’t be too young. I still remember the year it took me to catch my first fish, as my dad let me run riot round the lake chasing perch that i could see. Crying after letting a pike he caught go because i wanted to hold it for ever. My dad never really got into the environmentalist side of things, he fished on his own or with me and non of his mates fished. Like myself growing up it was something i did on my own, i managed to convince my best mate of now 25 years to come and he fell asleep against a tree and fell in. He still won’t come a second time. 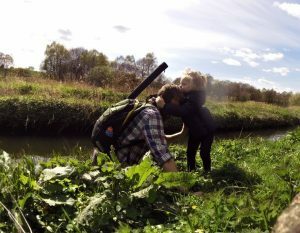 I started Emily off just observing, teaching her about what to do and how to look after the fish, being a fly fisherman on the river you do get right into the nitty gritty, we would bug hunt to see what lived there and it’d be proper wellington boots situations. Still end up with a wet arse from a slippy rock, so i always took spare clothes for her after that. 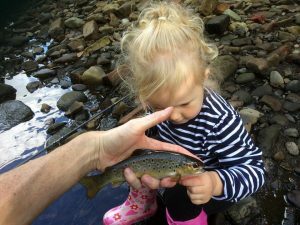 As she learned how to use a reel and rod and how to fight a fish, then came the introduction of holding them, stroking them at first she opted for, then after rejecting my offer to hold it i would let it go. The tears would flow just like mine did as a child. Catch another she would say. She got a knack of naming the fish, big bad barry and the Trolls characters. 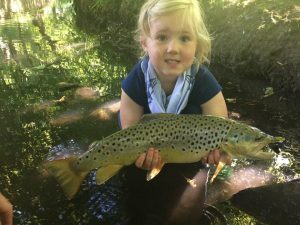 Strangely even though i would fish for less time and less distance i would break my PB 3 times in her presence she was turning into a good omen, i mean United haven’t won the league since she was born. 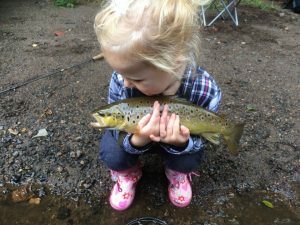 But as she grew older i have her more responsibility, i kept her on simple nymphing methods in easy to fish pools and if she lost a fish she would lose it. It happens, i would guide her but not physically. The fish she caught would get bigger and bigger in fact a lot quicker than mine did in my first years fly fishing. 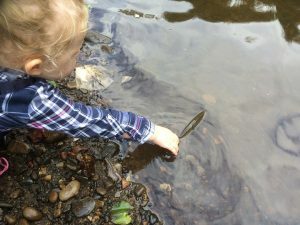 Aside from the fishing our chats would be very intuitive, she would ask me questions about why the rivers are brown, how is plastic made, why people throw ‘garbage’ (thanks ryanstoyreview) into the river, all manner of questions that i never thought she’d care about. She knows about trees, flowers and most definitely hogweed, nettles and brambles. She knows about the birds, the fish and the bugs. She knows how to build campfires and small shelters. But most of all she knows what it is like to be away from everything. 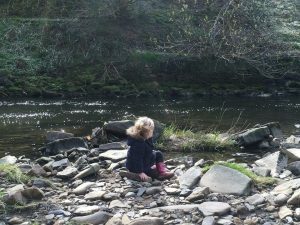 We can find a place of solitude miles from the city centres or literally in them, the real wilds of the country going by unnoticed and i hope should she, when shes older, ever need to just get away from it all, she now knows places to go. The sound of the river flowing past, a dipper or a wagtail on a boulder opposite, a ripple breaking the surface as a trout takes an olive off the top. The laughter and chatter of a father and daughter enjoying themselves as they have a small dinner at the riverside.